One thing that sets Sugarloaf Crafts Festivals apart from many other events is our live demonstrations of artists at work. These are unique opportunities to watch blacksmiths, jewelry makers, wood carvers and other artists create their one of a kind work right before your eyes! We hope you’ll join us in admiring these talented artists and many others during our fall shows. If you haven’t bought your tickets yet, you can buy single or group tickets online and save up to 30%. Each ticket is valid for the entire weekend. Stop by Carson Sam’s booth at the Timonium, October Gaithersburg, November Gaithersburg and Chantilly shows and see how swiftly he transforms recycled metal into new grilling tools, wall hooks, Renaissance knives and ornamental sculptures. Many years ago while attending a Sugarloaf show, Carson Sams watched a veteran blacksmither demonstrating his craft. He asked a few questions about how to learn blacksmithing and before long, Carson went from working at Lowe’s to exhibiting his own wares at Sugarloaf Crafts Festivals! 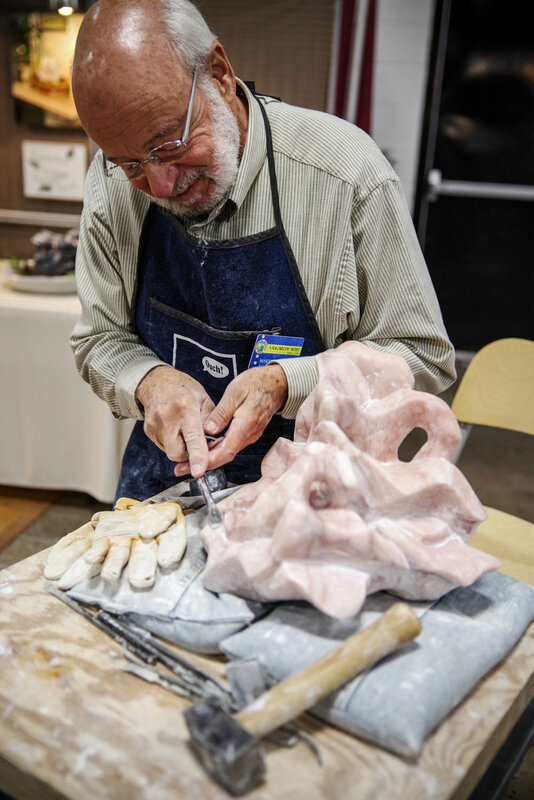 Sculptor, Marty Silverman of The Fountain and Sculpture Garden says sculpting is his creative sweet spot since he is most comfortable creating in three dimensions. Although sculpting is a slow process, Marty doesn’t mind. He sees each piece as its own journey. Visit Marty’s demo station at the Timonium/Oaks/ Edison/Chantilly shows and enjoy a rare opportunity to see a sculptor at work. Marty will be demonstrating in Timonium, Oaks, Edison and Chantilly. Watch Bob DeWitt of DeWitt’s Spoons & Bowls as he hand carves beautiful, durable bowls, platters and kitchen utensils using simple hand tools. He’ll gladly tell you about the week long soaking, sanding and oiling treatment he uses on his wooden utensils. This painstaking process ensures a smooth finish on the wood and a strong utensil that will most likely never need replacing. Bob will be demonstrating at the October and November Gaithersburg shows as well as the Oaks and Chantilly shows. John Akkus of Akkus Silver Touch uses a wood turning lathe adapted for metal spinning to create captivating ornamental pieces. He enjoys showing art lovers how he turns raw copper and brass into marvelous engraved wearable art, ornaments, vases and plates. 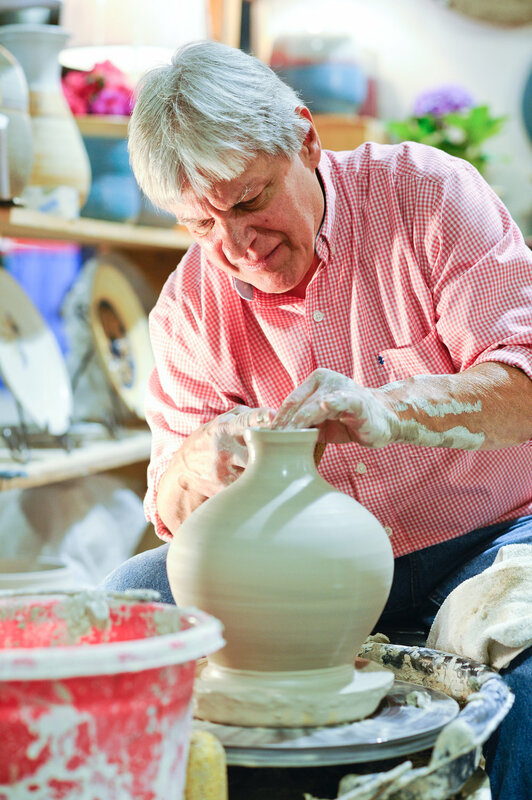 John will be demonstrating at all 6 fall shows! Alan Uchin is one of the artists from Purple Gem Jewelry of Birchrunville, PA. Purple Gem creates one of a kind jewelry by combining texture metals with rare fossils and stones. Alan loves collaborating with customers to turn their ideas into jewelry items. Alan will be demonstrating in Gaithersburg (October and November), Oaks and Chantilly. Roxanne Parent of Roxie’s Studio makes many ceramic items such as bowls, platters, pitchers and vases. She adds a touch of whimsy in her cheese platters designed to look like beach towels and vases sculpted to look like a men’s dress shirt and tie. Helen Weichman of Groundhog Blues Pottery is a passionate animal lover and loves to immortalize them in ceramic form. She specializes in making pet sculptures from her customers’ pet photos. Whether you like a realistic or anthropomorphic sculpture, she is sure to pick up on your pet’s playful and mischievous qualities. Newer PostTimonium - Top 10 Must See!